Four-time GRAMMY®-winning R&B/Pop songstress Regina Belle is a different story. Even as the New Jersey native rode high in the urban charts throughout the ‘80s and ‘90s with such urban classics as “Baby Come to Me,” “Make It Like It Was” and “What Goes Around,” faith, churchgoing, and gospel music remained at the very core of her life in the spotlight. Today, Belle is a pastor’s wife and minister of music at New Shield of Faith Ministries in Atlanta, where her husband, John S. Battle III, is senior pastor. A precocious singer since a young age, Belle launched her music career with a bang when, as an 8-year-old, she performed her first church solo—a take-no-prisoners rendition of the gospel standard “Don’t Drive Your Mama Away,” originally by none other than Shirley Caesar, one of Belle’s early influences. Such was Belle’s talent that, by age 12, the budding songbird had her first professional gig, and, come high school, she received a full scholarship to attend the prestigious Manhattan School of Music. Her stint at the school was instrumental in laying the groundwork for Belle’s future endeavors. There, she was mentored by the tireless Inga Wolfe, a diligent voice teacher who believed in Belle’s unpolished gift so much that she was moved to tutor her in private. Unlike her musically inclined schoolmates, Belle actually had to work hard to bring out the best in her. “When I came into the school, I never really thought I was going to make it,” Belle says. That desire to expand her horizons drove Belle to Rutgers University, where she majored in history and accounting, two careers she complemented with music courses at what is now the state college’s famed Mason Gross School of the Arts. Once there, she was mentored by professors William Fielder and Kenny Barron, two greats who built on Belle’s raw talent and previous schooling and provided the tools that prepared her for the national stage. It wasn’t long until Belle scored for herself a solo deal with Columbia Records, a successful partnership that yielded the albums ALL BY MYSELF, STAY WITH ME, PASSION and REACHING BACK. STAY WITH ME, in particular, catapulted Belle to the No. 1 slot of Billboard’s Top R&B/Hip-Hop Albums tally, a feat driven in part by two chart-topping singles, “Baby Come to Me” and “Make It Like It Was”—the latter a soulful ballad originally passed on by the Winans. The whirlwind of activity, accolades, and media attention eventually got the best of the singer, to the point that her gospel foundation was put on the backburner—no more testifying like Pastor Caesar anymore. Slowly but surely, God began smoothing Belle’s rough edges, showing her that His power could be made perfect in even her darkest weakness—in her case, her ongoing bout with pride and self-sufficiency. “The Lord had to deal with me in that aspect because He allowed me to know that I needed a little bit more humility in my life, that everyday that I get to be on this planet is because of Him, not me,” she says. In the vein of great gospel storytellers, Belle recounts the story of the woman who touched the hem of Jesus’ garment in the heartfelt “Who Touched Me,” a song that slowly builds from a gently caressed keyboard to an impassioned cry of heart. That song is the perfect segue for one of LOVE FOREVER SHINES’s early climaxes, the sprawling, take-it-to-the-old-school “God Is Good,” a song that is both an acknowledgement of God’s never-ending goodness and a testament to the influence Belle’s grandfather had on the singer growing up. 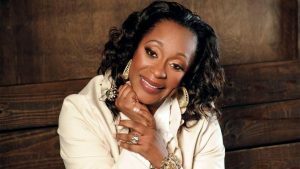 Ultimately, Regina Belle wants to communicate both sides of the spectrum: that life is not just about the mountaintop experiences, but that it’s also about the valley of the shadow of death, that dark place of despair where, above all, love forever shines.